In this tutorial, we are going to use an Nginx reverse proxy to handle HTTPS requests and redirect to the nextcloud container we deployed with docker. We are also going to use docker-compose to manage the multiple containers (one for Nextcloud, and one for the reverse proxy). If you are already using a reverse proxy, you can skip this tutorial and just give it your SSL certificates and have it forward plain HTTP requests to your nextcloud server. Make sure you are using the decrypted private key file. Create a docker-compose.yml file like so, making sure to replace nextcloud.programster.org with whatever your nextcloud server's name is. Stop and remove any existing nextcloud containers you have if you have any running. 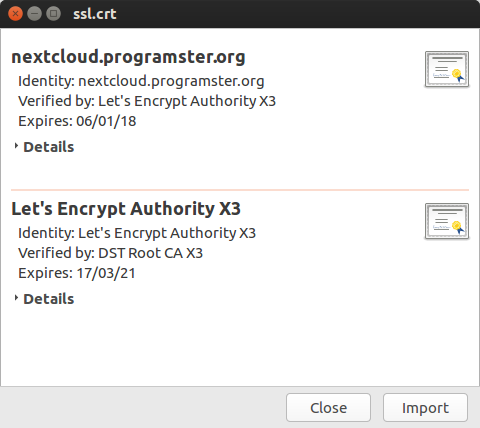 You should now be able to log into your nextcloud server using HTTPS. When I first performed these steps, my nextcloud server would only show a blank page. It turned out that it could no longer find the database server and the DNS was no longer resolving correctly. I fixed this by editing the config.php file at $HOME/nextcloud/config/config.php, as root. I then found the line with dbhost and changed it's value to the IP of my database server, rather than its hostname.